Pickup is in Salt Lake City near the SLC International Airport. Every tour will have reserved campsites each night included, as well as suggested first-come-first-serve campsites along the way. Also included are all the fees for the national park entrance passes. This is a camping tour! You are NOT staying in a hotel. For people who love camping, we prepare everything for you. You will love it and you will be awed! First, remember this is a camping trip. For people who love camping you will be outside every day exploring nature and sleeping under the stars. You won't be in a hotel and although there is a shower tent (water bag hanging above you) the only running water are the tiny showers in the campground. 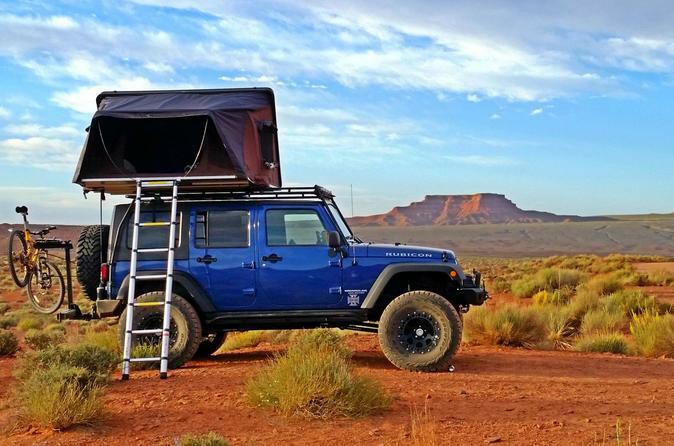 Again, when you sign up for a camping trip you're signing up for an adventure. Also, you will be traveling through high elevations, so move slowly the first couple days and drink lots of water. Also, during the summer the temperature gets over 100 degrees Fahrenheit every day. Dress appropriately and bring lots of sun block! Pickup at our office location in Salt Lake City near the Salt Lake International Airport. Go over gear usage, safety tips, and trip itinerary breakdown. Then, drive to supermarket to pick up your first day food order (first one is prepared by us). Then its a scenic 3-hour drive to Moab, Utah. Your first stop will be at Deadhorse Point State Park for the famous overlook to give you a taste of what's to come. Afterwards there is a warm-up hike in the Canyonlands to get your first taste of an arch. Then head to camp early and practice using the equipment and having a family dinner under the stars. Day 2 will be spent exploring the amazing Arches National Park. The main attraction for the day will be the world famous Delicate Arch, but there are several other hikes and arches for you to see! If you've never seen a sandstone arch before prepare to be amazed. If its summer and hot there are swimmings holes near Moab to cool off. Also, head in to Moab if you want to eat at one of the restaurants, and to stock up on supplies to bring back to the campsite. This is a continuation of Arches National Park. Its a small park, but there is still too much to see and do in just one day. If you've included the Extra Option: Fiery Furnace Guided Tour. Also, there are scenic Jeep trails to explore. They take you amazing overlooks and give you a break from walking. Today is a break from the hot hiking for fun in the water. If you've included the Extra Option: White Water Rafting then you'll head up the Colorado River in the morning. Otherwise there are hikes in the Canyonlands (a great place to escape the crowds) as well as amazing Jeep roads with unforgettable views. After breakfast, pack everything up and prepare for one more road trip on the way back. 1.5 hours from Moab is Goblin Valley State Park, home to the HooDoos, the mushroom shaped rocks. Its an alien landscape and you'll spend a fun morning exploring. After lunch, drive back to Salt Lake City for vehicle return and equipment inspection.